1953: Yves Tanguy and Kay Sage tour France and Italy. 1953: Richard Stankiewicz solo exhibition at the Hansa Gallery. 1953: Willem de Kooning Retrospective at the Workshop Center for the Arts in Washington and School of the Museum of Fine Arts in Boston. 1953: Robert Rauschenberg erases a de Kooning. Rauschenberg arrived at de Kooning's studio with a bottle of wine and asked him if he could have a drawing to erase. (DK360) It took Rauschenberg nearly three weeks to erase the drawing that de Kooning provided. I love drawing, and one of the things I wanted to try was an all-eraser drawing. I did drawings myself and I erased them, but that seemed like fifty-fifty. So then I knew I had to pull back farther. If it was going to be an all-eraser drawing, it had to be art in the beginning, and I went to Bill de Kooning and told him about it. When I was knocking on the door, I was hoping he wouldn't be there, so I wouldn't have to go through with it. But he was, and we went through this thing, and even though he said he didn't approve of it, he didn't want to interfere with my work. 1953: Willem de Kooning drinks. 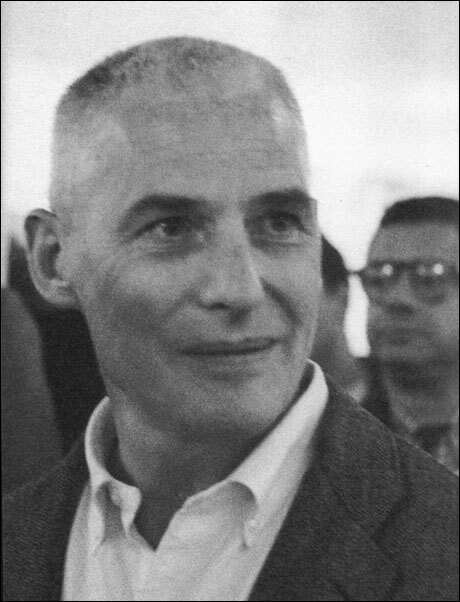 According to de Kooning biographers Mark Stevens and Annalyn Swan, de Kooning's drinking increased after he asked Alcopley for advice on controlling his heart palpitations. His [de Kooning's] heart palpitations worsened. Sometimes, he thought that he was dying. One night he rushed over to the studio of Conrad Marca-Relli and pounded on the door. "He woke me up about two in the morning and said, 'Jesus Christ, I think I'm going to die. I can't stop'" The doctor had told him "You've got to calm yourself. You're overanxious. This whole idea of painting a figure and destroying it... this is doing something to you''... In desperation, he asked Alcopley - whom he knew to be a scientist as well as an artist - for advice. Alcohol widens the arteries around the heart, Alcopley told him, thereby improving the circulation of the blood. Why not have a drink to calm down? 1953: Robert Motherwell's daughter is born. 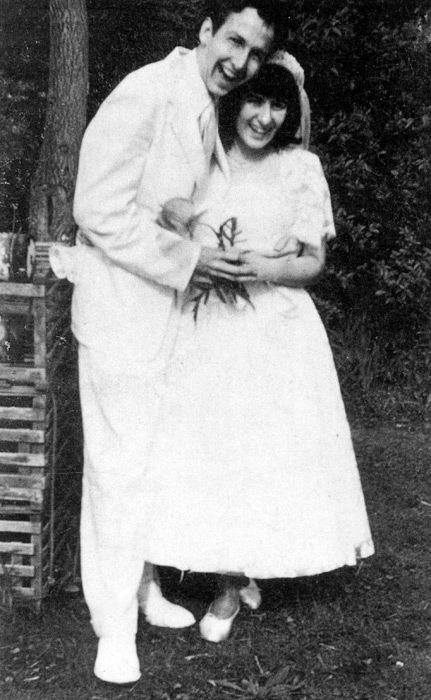 Motherwell had divorced the Mexican actress, Maria Emilia Ferreira y Moyers, in 1949 and married Betty Little in 1950. His first child, Jeannie, was born in 1953. (HM) Jeanie Motherwell was educated at the Art Students League and Bard College and is currently an artist. 1953: Adolph Gottlieb designs Ark curtain for Congregation Beth El, Springfield, MA. 1953: Adolph Gottlieb participates in the conference "Art Education and the Creative Process" sponsored by the Museum of Modern Art. 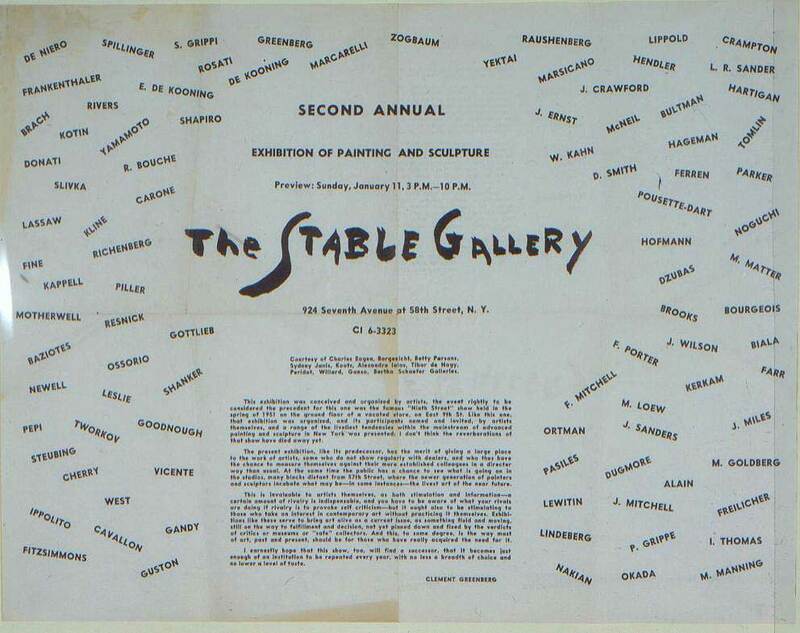 January 1953: Second Annual Exhibition of Painting and Sculpture at the Stable Gallery. 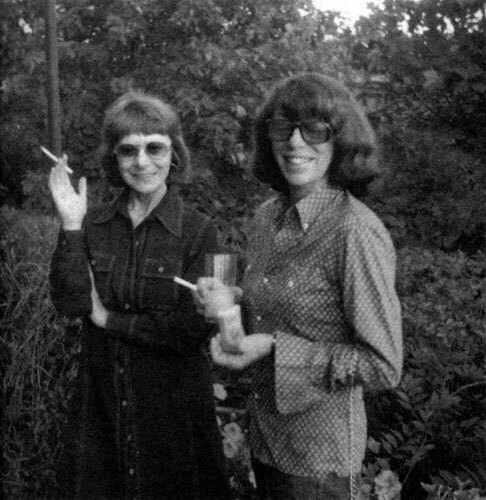 Included Franz Kline, Robert Motherwell, Adolph Gottlieb, Philip Guston, William Baziotes, Alfonso Ossorio, John Ferren, Elaine de Kooning, Robert Rauschenberg, Jimmy Ernst, Richard Pousette-Dart, Bradley Walker Tomlin, Hans Hofmann, Grace Hartigan, Jane Freilicher, Joan Mitchell, Jack Tworkov, Helen Frankenthaler, Isamu Noguchi and Earl Kerkam. Clement Greenberg wrote the text on the poster which can be found here. c. January 1953: Philip Guston exhibition at the Egan Gallery. The exhibition in 1953 was widely discussed. It set the small gallery aglow with reverberations of light that led many to talk about Guston's work in terms of "Abstract Impressionism..." Guston's new work was regarded with sympathy, although newspaper reports were hostile... Fairfield Porter, writing in Art News [February 1953], sees the paintings as descendants of Cézanne's watercolors, but with less air. "Where he weaves the paint again and again the color gets pinkish and translucent, like a bit of sky from a landscape by Sisley or Pissarro. In the middle there are a few bright red or orange strands that center the weight and the color. He seems to have gone beyond Cézanne to Impressionism thereby developing what could be an essential of this style." The reference to Cézanne is apt, but those to Impressionism and Sisley are somewhat misleading.. Until roughly 1954, several critics placed Guston more precisely in the radical perspective of the whole Abstract Expressionist movement. January 16, 1953: Discussion of Harold Rosenberg's article, "Action Painting," at the Club. January 23, 1953: "Young Artists" at the Club. February 6, 1953: "Spectorama" at the Club with speaker Yanti Shawnsky. February 7 - 27, 1953: Robert Motherwell solo exhibition at the Fine Arts Club of Chicago. February 13, 1953: "Museum Exhibitions" panel at the Club. February 27, 1953: "Trends in Contemporary Sculpture" at the Club. Panelists: Sid Gordin, David Slivka, Isamu Noguchi and Ibram Lassaw. March 1953: "De Kooning Paints a Picture" by Thomas Hess appears in Art News. March 16, 1953: De Kooning's first show at the Sidney Janis Gallery opens. March 20, 1953: "Sculpture II" at the Club. March 27, 1953: "The Figure in Painting" at the Club. April 1953: Jackson Pollock drives on the wrong side of the road. Pollock continued to drink, often ending up at the East Hampton police station being reprimanded for drunken recklessness. One of his favourite local bars was Cavagnaro's on Newtown Lane. The owner later recalled him "pulling up in his coupe at eight-thirty or nine in the morning for his double Grand-Dad on the rocks." (JP238) In April Pollock drove on the wrong side of the road on Main Street forcing another motorist off the road. April 3, 1953: "Where the Arts Meet" at the Club. It included four paintings by Jackson Pollock: The She-Wolf, Number 6, 1952, Convergence: Number 10, 1952 and Number 12, 1952. April 17, 1953: "Image of the Clown" at the Club with speaker Wolfgang Zucker. Spring 1953: Franz Kline moves to the top floor of 32 East 10th Street. Spring 1953: Philip Guston and Franz Kline exhibit in a group show at the Fine Arts Festival in Greensboro, North Carolina. May 1, 1953: "After the United Nations Building" at the Club. May 11, 1953: Bradley Walker Tomlin dies in New York City. c. Mid 1953: The Rothkos take on a lodger. May 22, 1953: "Vocabulary vs. Modern Art" at the Club. June 1953: Barnett Newman buys one of his own paintings. June 17 1953: Alfred Jensen visits Mark Rothko. 1953 - 1954: Franz Kline teaches at the Pratt Institute. October 15 - December 6, 1953: Jackson Pollock shows at the Whitney Annual. November 22, 1953: "French Criticism and American Painting" at the Club. December 23, 1953: Jackson Pollock is found in a drunken stupor outside a police station.